Olive Street Development, LLC is a developer of old brick buildings, like abandoned schools and factories, with the goal of recycling and repurposing these historic structures for efficient and affordable housing. 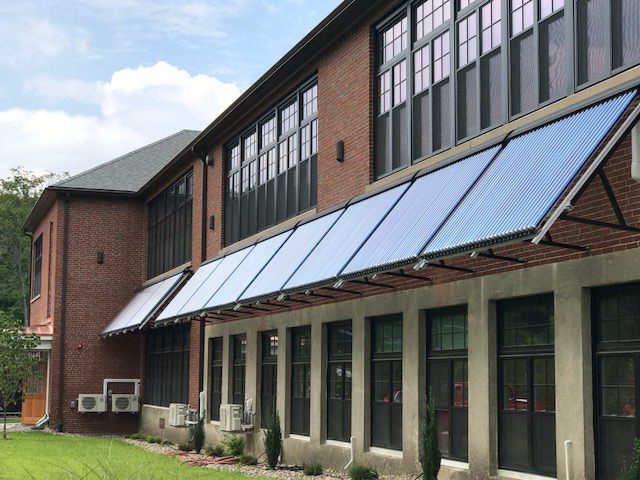 Over the past several years, the developer has leveraged multiple MassCEC Renewable Energy Programs to accomplish a project on School Street in Montague, MA. In 2016 and 2017, Olive Street Development LLC transformed an abandoned school building into a 22-unit apartment complex in Montague, MA. With the goal of designing and developing net-zero buildings in affordable spaces, Olive Street Development pursued multiple renewable energy systems to support the heating, cooling, hot water, and electricity demands of the building and its tenants. In 2016, the project was awarded a grant through the Commonwealth Solar Hot Water program to install 10 evacuated tube collectors to supply an estimated 65% of the development's domestic hot water. In 2017, the project secured additional financing through the Commercial-Scale Air Source Heat Pump program to install a system of 24 Mitsubishi Hyper Heat ductless mini-split heat pumps that heat and cool the 22 apartments. The design created a well-insulated envelope while providing maximum comfort for the occupants. The project site also boasts a solar PV parking canopy, to offset some of the electricity costs for these tenants.